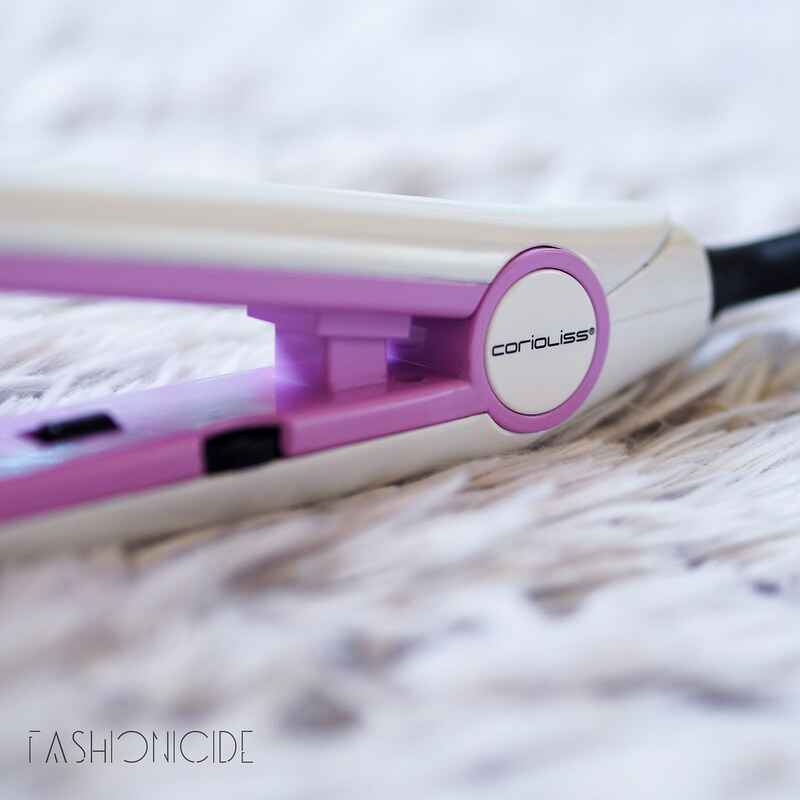 HAIR || Design Your Own Straighteners with Corioliss & Glamour Wand Giveaway! Hands up if you remember Corioliss? Way back in my teenage years, sadly now a bit of a blur, Corioliss were huge - GHDs were the mainstream, but Corioliss were the cult favourites. Up until recently, I'd been using a set of Corioliss C2s for the best part of a decade. Although the casing design wasn't really to my taste, a red leopard print number, I wasn't all that bothered, because the smooth titanium plates were gliding effortlessly through my hair without tugging. And unlike the GHDs, of which I tried a pair briefly, the Corioliss straighteners didn't come with that awkward habit of blowing up. Which is always a bonus. Anyway, moving on to today's world, and Corioliss have evolved. They now offer a range of designs, including zebra print, marble print and unbelievably, designing your own straighteners! The titanium plates are still a feature, so you won't have to worry about those troublesome ceramic ones, which aren't quite as smooth and thus more damaging to the hair. The 'design your own' thing really caught my attention, so naturally I had to have a go! 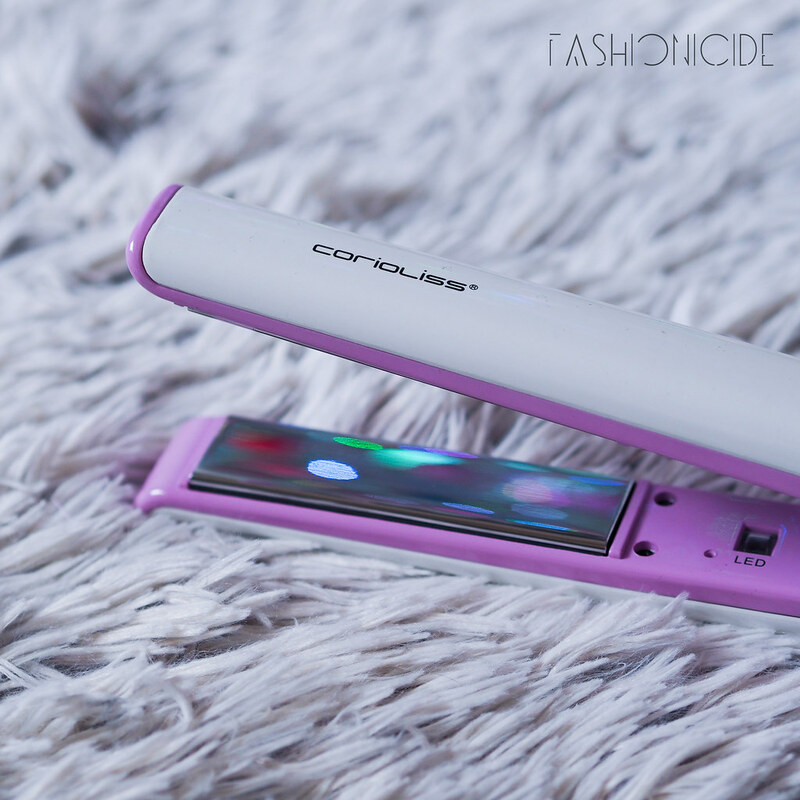 Of course you can't design the shape or add or remove features, you work with your own pair of *C1 Hair Straighteners, which have 2.5cm wide multipurpose plates that will suit both straightening and creating curls. I wanted to create something that felt very 'me', so for the outer casing I chose to go for white, as it matches the minimalistic aesthetic of my bedroom, and for the inner casing, I injected some lilac, because... well... pastel. So of course they look gorgeous, but what of the C1 Straighteners themselves? Well, they come with a nice sturdy triangular bag to pop into for storage, as well as finger gloves to protect your... fingers. These are incredibly handy, as I'm prone to accidentally burning myself! On the inner casing, there's a Temperature control switch that lets you set the temp between 120C and 235C. With my bleached hair, this temperature range is spot on for me, as I don't want to be straightening too often, and when I do, I want to make sure the heat damage is minimal, so 120C works pretty well. The highest heat setting would be no beuno for me, as it would literally fry my hair. Not a good look. The great thing is though, the 120C setting still straightens my hair in one effortless glide, with no tugs, and I don't need to go over it again. With the plates being so smooth and shiny, it's really easy to wipe clean any of that pesky product build-up you get from the likes of Heat Protection sprays, something that's much more difficult with ceramic plates. Well, the lovely lot at Corioliss have kindly given me a Glamour Wand for a bit of a blog giveaway! 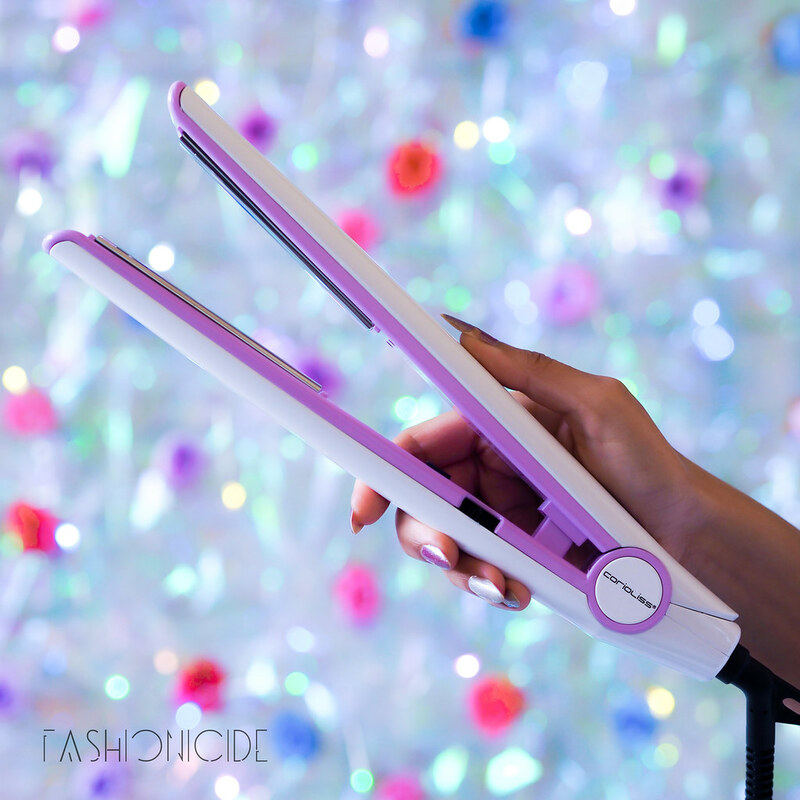 The Glamour Wand allows you to create full on curly locks or soft, loose waves and comes with a clever 'cool tip', so no burned fingers here thank you very much! They've also thrown in "The Brush" which is a cushion brush that'll come in handy after you've curled your hair. To be in with a chance of winning, all you need to do is enter below! Please note only open to UK entrants, and the closing date is 14th June at 8pm UK time! 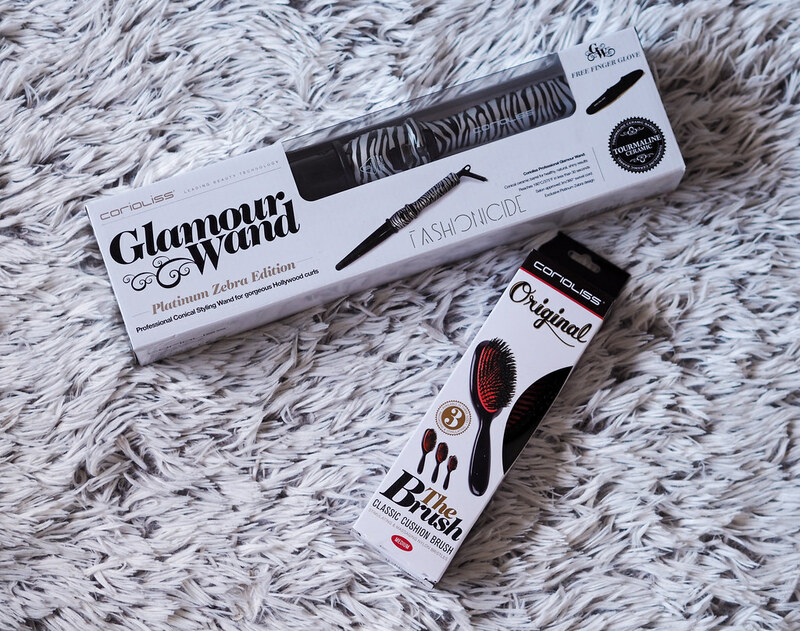 Corioliss Glamour Wand and The Brush giveaway! 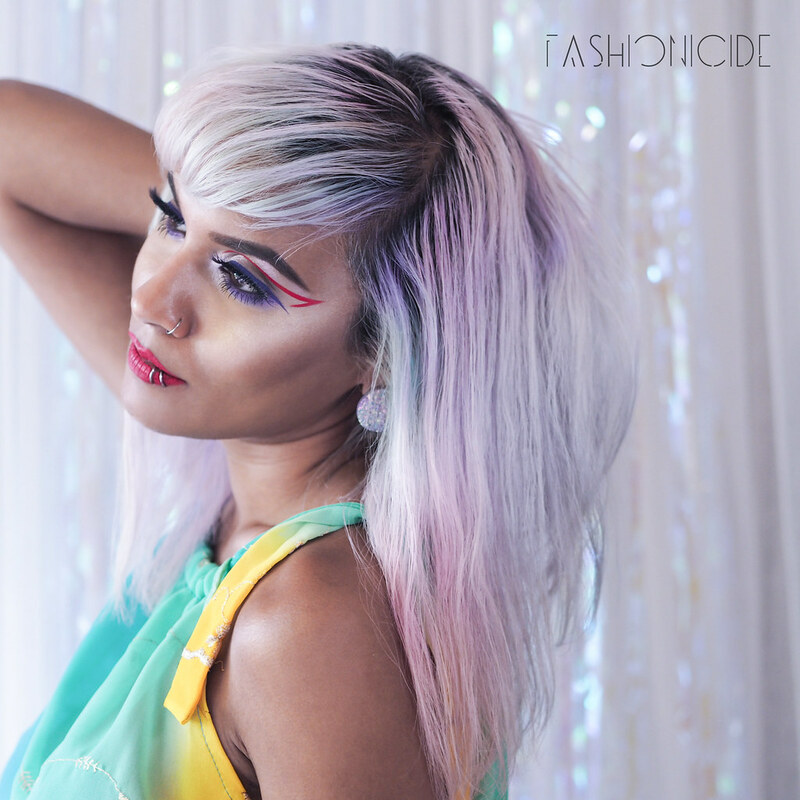 I was just wondering if you still use TIGI true light to bleach your hair?? And if not, what have you currently been using (as your cool white color looks awesome!) annnnd one more question.. have you tried Tigi true light white vs the regular true light (violet) and which do you prefer/ which has a better lift? Ok thank you sooooo much for helpin a girl out! I love your blog and your style! I don't as I can't seem to find it! 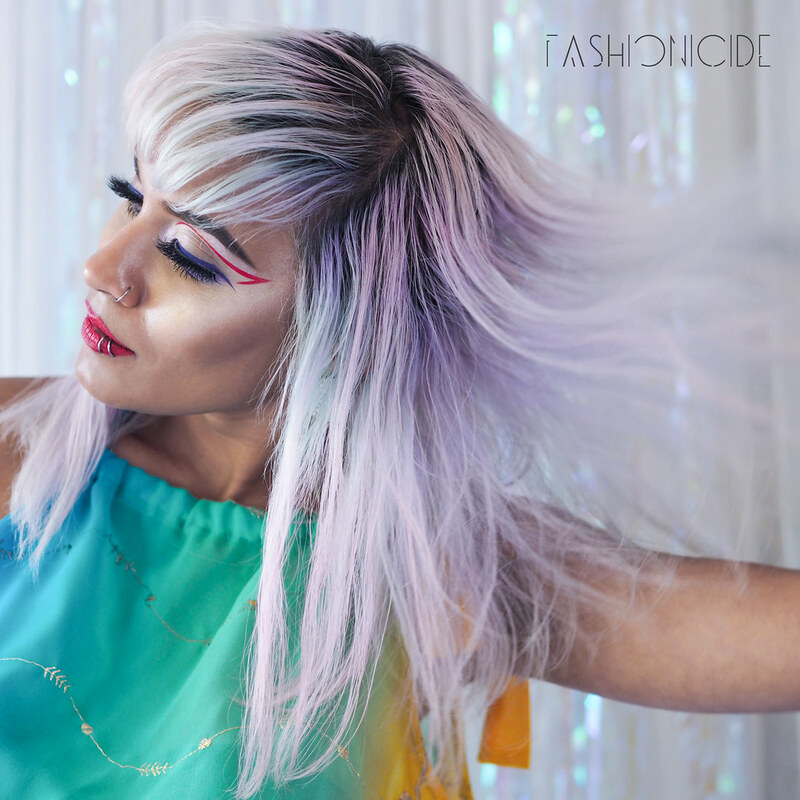 I use Wella's Blondor which is a violet bleaching powder, gives a real nice clean lift. As for Tigi's True Light, I much prefer the True Light which again, is violet which majorly helps when it comes to bleaching. I don't know what it is about the idea of having something personalised but when I hear that I can, I just want them!! Love your hair colour by the way.